A demonstration has taken place at an atomic weapons base over plans to build a new multi-million pound facility at the site. The Atomic Weapons Establishment (AWE) in Aldermaston, Berkshire, provides the warheads for Trident, the UK's submarine-launched missile system. Anti-nuclear group Trident Ploughshares said 20 members had joined a "blockade" during Monday's morning rush-hour. Three people were arrested, but the group said they were not its members. Ministry of Defence Police said two men, one from London and one from Oxford, aged 43 and 47, and a 63-year-old woman were arrested on suspicion of criminal damage. 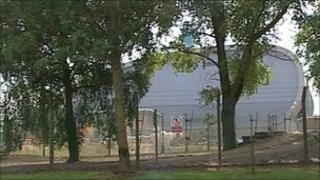 A spokesman said damage to AWE's perimeter fence had been discovered at about 1110 BST. The three were taken to Newbury police station where they remain in custody. A Trident Ploughshares spokesperson said: "Four of [our] activists chained themselves together with arm tubes and lay down in front of the gate for two hours, but released themselves without any being arrested shortly after 9am. "Others stood close to them with banners, and sang songs. Many workers trying to enter the base were diverted away by Ministry of Defence Police, who were in attendance; but traffic on the public highway appeared to be unaffected." The spokesperson said the protesters were also campaigning over the safety of the site and its "environmental implications". Earlier this month, a fire started inside a bunker. A worker was injured and people living close to the site were evacuated.